"Part of the genius of this event is that it wasn’t just a birthday party, it was also a celebration of song, songwriters, community, and friendship." E.G. Phest is an annual show that E.G. Phillips hosts in August where he invites other singer-songwriters from the San Francisco music community to come perform his songs as part of the celebration of his birthday. The venues hosting this event are on the small and intimate side and the atmosphere is relaxed. Streamers and balloons are traditionally put up and there's a card to sign in accordance with the whole "birthday" aspect of the festivities, but the real focus is on the art of performance and the performers, usually numbering around a dozen, who put their own distinctive spin on a body of work that spans many years and a variety of genres. Inspired in part by the Bob Dylan 30th anniversary concert and the Hotel Utah open mic's "cover your friends" night (Phillips will also note -- only partially in jest -- that the idea was to ask for a gift that was within the budgetary limits of most musicians) the whole affair actually harkens back to older ideas about the sharing of songs and musicians building off and riffing off each other's ideas. Everyone who participates or attends always has a splendid time and insists this odd little affair must happen again next year -- often with a request to do one song or another. Some of the performers continue to play the songs they take on and a few have even gone on to record their versions -- though nothing compares with being at the show itself. The performers come from all walks of life -- there are industry veterans and new comers, men and women, solos and duos, young and old. E.G. Phest alums include Shawn Byron, The Complements, "James Delmar," Brendan Getzell, Maya Hall, Josh "Beemish" Johnson, Allie Jones, Eugene M. Joseph, Samantha Margret, Christopher Mizell, Ken Newman, Mario M. Noche, The Old Kraftsman (Chris Martellotti), Oscar Plizga, Michelle Renee, Naghmeh Shaf, Nina Jo Smith, Swamp Child, Joel Taylor, The Ten Thousand Ways and Wesley Woo. The artwork for the show is itself is a cover of sorts, with E.G. asking a local illustrator to do their take on his "Ducks With Pants" ... "theme." Josh Johnson provided the artwork for the 1st EGPhest and Clyde Always did the artwork for EGPhest II. 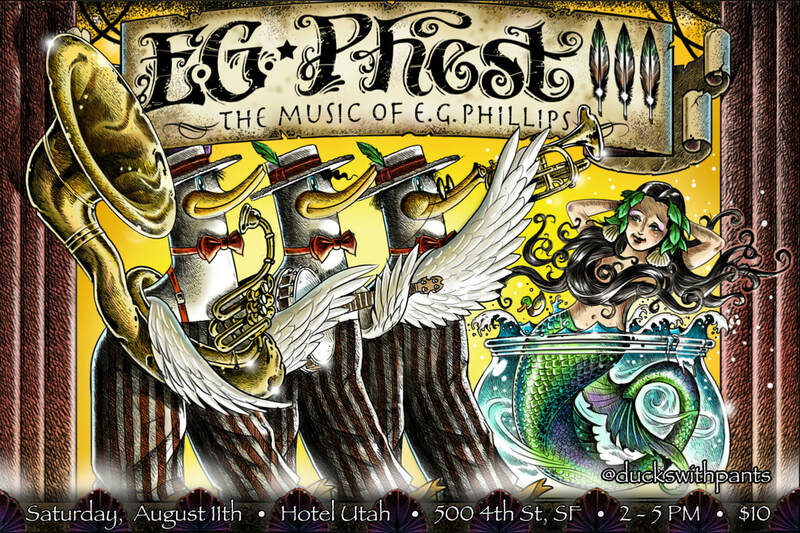 On August 11th, 2018 EGPhest III was held at the Hotel Utah as a matinee show and featured returning EGPhest alums Shawn Byron , The Complements, and Ken Newman as well as Drew K, Teresa Tuan (of Oh The Nerve) and Tohm as well a special guest all the way from Madrid Spain, Natali Castillo who brought her accompanist Pepe Arribas along and he played a tune too . Artwork for the 3rd installment was handled by Mario M. Noche, himself an EGPhest alum (who happens to share the same birthday). ​See the big blog post for the photo gallery of E.G. Phest III performers.